40 years after first tying on his apron, Chef Jonathan Landeen is still having fun. 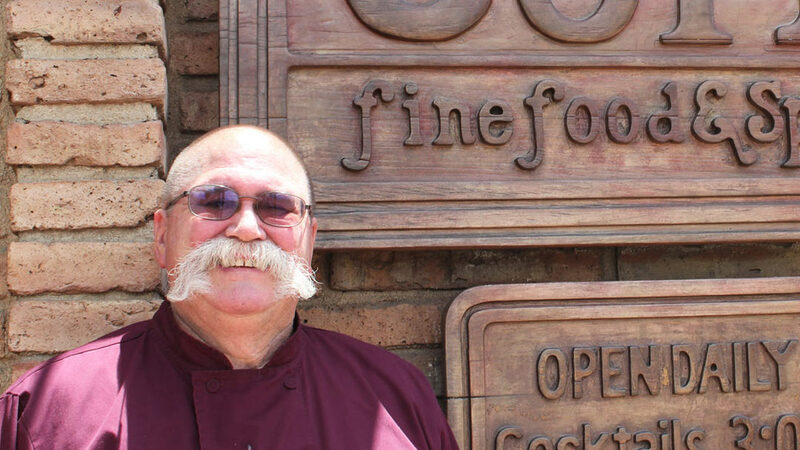 There’s one thing you can say about Chef Jonathan Landeen–well, actually there are a lot of things you can say about the man with the large moustache and a hearty laugh–but one thing for sure: after 40 years wearing a cook’s apron, he still enjoys what he does. “It’s fun to do something you’re comfortable with, and for me, this is easy and a good artistic outlet. I love to eat and I can cook just about anything, so it all works out OK,” says the owner of Jonathan’s Cork (formerly Cork and Cleaver). The Nebraska native got transported to Tucson as a youngster in the late 1950s when his doctor dad set up a practice here. Landeen, the son, bounced around for a number of years in a variety of jobs–door-to-door Fuller Brush sales; lifeguarding; a laborer at Grant Road Lumber, and a distributor of adult beverages for Findley Distributing–until he ended up in New Orleans working at Commander’s Palace with Cajun cuisine chef Paul Prudhomme. Back in Tucson in the late 1970s to help open Charles Restaurant and then bang pots and pans at The Lodge at Ventana Canyon, Sweetwater Café, and The Solarium, Landeen bought the Cork in 1994. After more than 22 years there, he’s apparently doing things right. “The boss [his wife, Colette] says I can stay,” he says, laughing. Landeen has always opted for the unique to match his own out-of-the-box life philosophies, like serving a full Thanksgiving dinner, from turkey and trimmings to cranberry-rhubarb jello mold and pumpkin pie, in the triple-digit heat of July – just because he had a hankering for turkey and didn’t want to wait. Jonathan Landeen, owner/chef, Jonathan’s Cork, known for his culinary craftsmanship and uncommon moustache. What’s the weirdest thing in your refrigerator right now? The food item you’re most likely to splurge on? Would you rather cook or be cooked for? Snack food you can’t get enough of?